Not many know that Googlers working on Android projects organise a podcast known as Android Developers Backstage. The podcast team includes Iliyan Malchev, Tor Norbye, Chet Haase and Romain Guy. There is no set day for these podcasts to show up, as some months have one of these podcasts while other months get to see more. Overall, these podcasts by the Android team at Google reveal important information. The latest podcast (posted yesterday) was all about Project Treble. 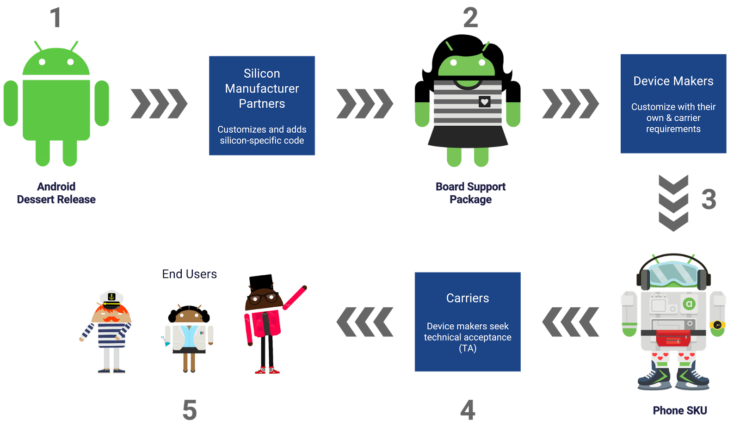 For those unaware, Project Treble is Google’s initiative to make Android easier and affordable for the OEMs. It also aims to help existing devices and make latest Android versions available. Constant updates are something where the Android ecosystem is far behind the iOS. With Project Treble, Google is working on eliminating the issue with major Android updates and their unavailability on devices. It is an undertaking to help Android devices with constant and faster OTA updates. The company revealed that it had completed the work of making the Pixel and Pixel XL compatible with Project Treble, however, it is not forcing other manufacturers to follow suit with their Nougat running flagships. Project Treble is a part of Android O, and it will be on the phones running the Android version, but now that’s easier and inexpensive for the OEMs to update their device to the latest version, doesn’t mean that they will do that. You see, it is also the OEMs responsibility to make sure that the update is rolled out to the devices, and if an OEM is not up for it, then Google can’t do anything about it. In the latest podcast, the Android team also confirmed that they are indeed working with “some companies” to update their flagships to Android O, which could result in faster updates for them. They also said that the team is working on “Treble-izing” them. For now, we don’t have any information about the companies involved in the “Treble-izing.” but it sounds great that Google is including OEMs in software development techniques. The podcast team also talked about the devices that are compatible with Project Treble, running the stock Android image. According to the information presented above, it means that if Samsung’s Galaxy S8 and Galaxy S8+ flagships are involved with Google for Project Treble, then their devices may be made to run stock Android.